This element is pulled into Lightview. For most of us the term street food may cause a feeling of anxiety or dismay, but in Thailand street food is different as it is present everywhere. In fact, people of Thailand do have at least one meal a day from street vendors. The vendors of small stands are equipped with tables and chairs on the sidewalk where diners can eat in the open. Fried chicken is a leading item on most street food menus. The food is fresh and rarely costs more than 40 baht, which is less than two dollars. The popularity of street food in Thailand is driven not only by convenience but also by the tradition of dining outdoors. Thanks to the competition and popular demand, Thai street vendors also offer great quality food. In Bangkok a visitor will be greeted with the pleasant smell of cooked food wherever he turns. 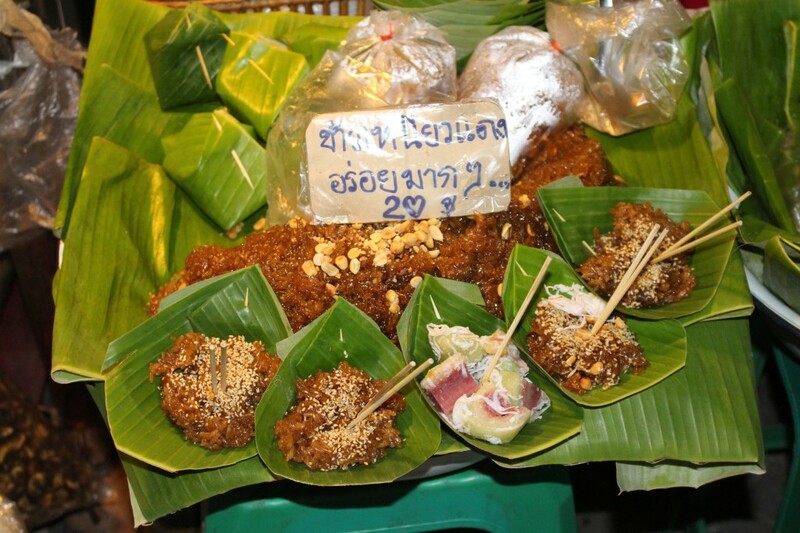 There are three varieties of street food in Thailand. Among the best food you can have from Thai street vendors is a variety of spicy noodles soup made of small noodles, pork, pork balls and vegetables that include lettuce and beans. 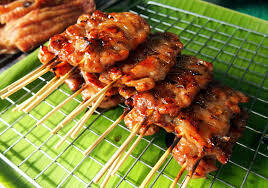 Grilled chicken on a stick is the most popular barbequed dish. Grilled pork dipped in “Nam Chim” a spicy sauce and roasted chicken cooked in a large pot over a charcoal fire are yummy. The fresh seafood in beach areas is highly sought after. Salted fish is a hot favourite throughout Thailand. It is cooked over a charcoal fire to add a unique taste with Nan chime to spice it up. Fruits: One of the healthier street foods of Thailand is fresh fruits, including watermelon, papaya, oranges, grapes, apples, bananas, mango, pineapple, coconut and other local fruits such as the sweet Gaou mung gone and Durian. Desserts: Homemade coconut ice cream served in a traditional cone or in an empty coconut shell with banana and egg inside is a special treat and so are fried bananas, which are absolutely tasty. Beverages: Besides a variety of beers and soft drinks Thai food also goes well with fruit smoothies or iced coffee. The smoothies of fresh fruit, strawberry, pineapple and mango are the most popular. Coffee: Thailand’s coffee is very delectable, especially the iced coffee. The street vendors will give you freshest coffee after grinding the beans in front of your eyes. The coffee brewed will then be mixed with condensed milk to be served with ice. To sum up, the highlight is the various healthcare properties of Thai food even as street food. Being inexpensive, on streets you can also eat healthy Thai food. Though you may miss the décor of a Thai restaurant, the fabulous taste makes you forget all about this.